Rick Bullock takes the road less traveled when he quits his job as an advertising executive to become director of a homeless shelter. Trading in a six-figure salary for paltry pay and even less respect? Costly. But helping one man get back on his feet? Priceless. When Zeus, a mentally challenged gentle giant and longtime shelter resident, is arrested for murdering evangelist Benjamin Kurios, Rick wants answers. Convinced Zeus is incapable of such a horrific act, Rick, along with a colorful cadre of characters, sets off on a journey to keep an innocent man off death row. 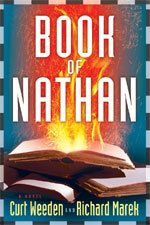 The trip takes a disturbing detour when the bizarre group stumbles upon a transcript of the Book of Nathan, a lost book of the Bible that finally ends the debate about when a human inherits a soul. As this controversial discovery attracts the sinister attentions of a Jersey mobster, pro-life and pro-choice groups, and a devious billionaire used to getting his way, Rick scrambles to stay one step ahead on this dangerous road—and save Zeus before time runs out. Corporate philanthropy is on its way out. A new concept called "corporate social investing"—which requires that every commitment of money and/or product/equipment/land a company makes must have a significant business reason—is taking its place. The transition has implications to every business and nonprofit organization in America. This book provides the strategic plan for making the transition to corporate social investing. By following the practical steps described here, businesses and nonprofits can forge creative alliances that can boost corporate profits and at the same time provide added resources for schools, colleges, cultural organizations, civic groups, and other important charities. Weeden's breakthrough plan, based on his innovative concept of corporate social investing, has the potential to dramatically change the way businesses and nonprofits interact. If widely implemented, it could substantially increase corporate support for nonprofits, turning the tide against cutbacks, offering profound benefits to businesses, and revitalizing the essential services nonprofits provide. In How Women Can Beat Terrorism, Curt Weeden sounds an urgent warning: If the world stays on its present course, terrorism and conflict may take the lives of over 100 million people during the next three decades. Give women the opportunity and resources to combat poverty and hopelessness that help fuel terrorism and the gloomy forecast improves, writes Weeden. A billion-dollar grant-maker who has worked for 30 years with international development organizations, corporations and foundations, Weeden concludes that in many poor countries, women are the pathway to a better quality of life—and to a future where terrorism becomes less of a threat. However, Weeden adds, empowering women in these poor regions of the world is not likely to happen without assistance from women in the U.S., Europe and other industrialized countries. 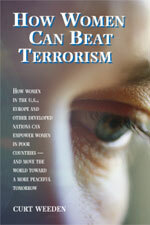 How Women Can Beat Terrorism presents a simple but compelling plan for helping billions of men, women and children living in poverty while at the same time making the Western world less prone to a multitude of deadly terrorist attacks. "This collaborative effort by former corporate exec Weeden and publishing veteran Marek is a wild ride. Mystery fans who crave fast-paced narratives and surprises at every turn will most likely get a kick out of this ambitious collaboration." "This is a very funny mystery with a clever story. The authors have a nice handle on dialogue and narrative description, and the story is convoluted enough to allow for plenty of funny scenes but without being too convoluted to follow. Lighthearted and snappy, it's sure to be a hit with comedy-mystery fans." "Read this book—it will change the way you think." "This book is a true contribution to the public, private, and nonprofit sectors and, more importantly, to the people." "Any nonprofit organization that hopes to get corporate support had better read this book." "Weeden marshals powerful arguments on behalf of equality, opportunity, and education for women." "To ignore Weeden's message is to play Russian roulette with our children's future." Copyright © 2019 Curt Weeden. To book Curt Weeden as a speaker or for information regarding Curt Weeden's appearance schedule and book signing dates, contact contact Business & Nonprofit Strategies, Inc., at president@businessandnonprofit.com or 843-276-5334.